Queens has been home to two of the NY Yankees most iconic players: Phil Rizzuto and Whitey Ford. Our Old Astoria neighborhood is home to the Whitey Ford Field, which is undergoing a renaissance, as is our entire neighborhood. NYC Parks Dept. 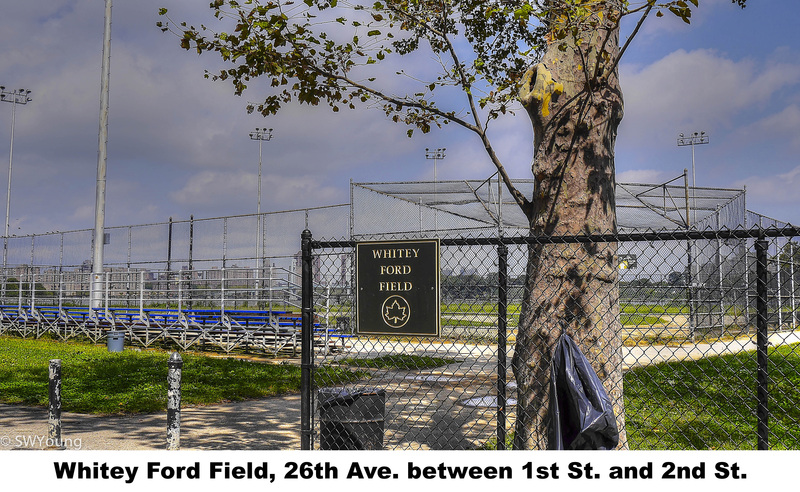 has received 2 million dollars in funding to renovate the field from Councilman Costas Constantinides and Borough President Melinda Katz and a new advocacy and volunteer group has been established: Friends of Whitey Ford Field. The Queens Chronicle has published an interesting article on these Queens natives. This is indeed an example of OANA’s motto: “Respecting the Past, Building the future”. A renovated Whitey Ford Field, with its magnificent views of the Triborough and Hellgate bridges, and easy access via the EastRiver Ferry, will help make Old Astoria a destination of choice for all New Yorkers.